Many college students spend their summer vacations on the beach, at a camp or relaxing at home, enjoying a well-earned break from research papers and exams. 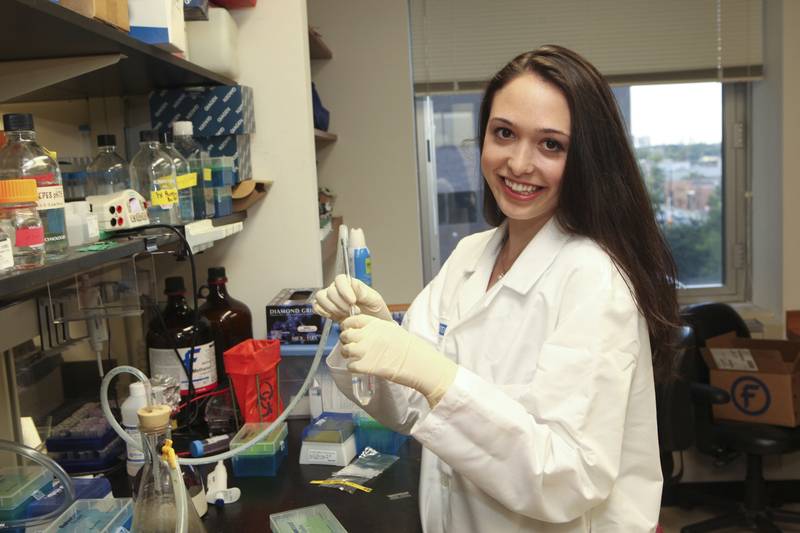 Bella Wolf, a University Undergraduate Summer Research Scholar, hopes to pursue a career in ophthalmology. Some, like Bella Wolf of Woodmere, NY, dissect mice eyes. “I hope to go to medical school and become an ophthalmologist, so I feel very fortunate that I have been given the opportunity to work directly with mice eyes to help determine the DNA pathways that leads to lens transparency and the ability to see clearly,” she said. 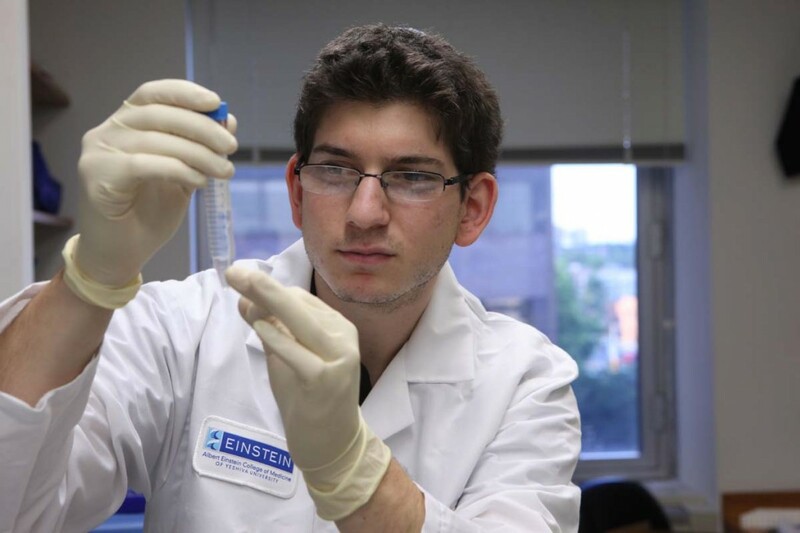 The Stern College for Women junior is one of ten Yeshiva University undergraduates participating in the Summer Undergraduate Research Program (SURP), an advanced biomedical research program at YU’s Albert Einstein College of Medicine. Directed by Dr. Victoria Freedman, Einstein’s associate dean for graduate programs in the biomedical sciences, and Dr. Barry Potvin, a professor at Yeshiva College and visiting professor in the cell biology department at Einstein, the program has drawn 55 students in total from a variety of colleges and universities to engage in cutting-edge scientific studies, mentored by Einstein faculty. “SURP provides a unique opportunity for students to work full time in a research laboratory, to attend lectures by renowned scientists who are describing their latest exciting discoveries, to meet students with the same interests from all over the U.S., and to live and work for nine weeks as part of a community of dedicated scientists,” said Freedman. 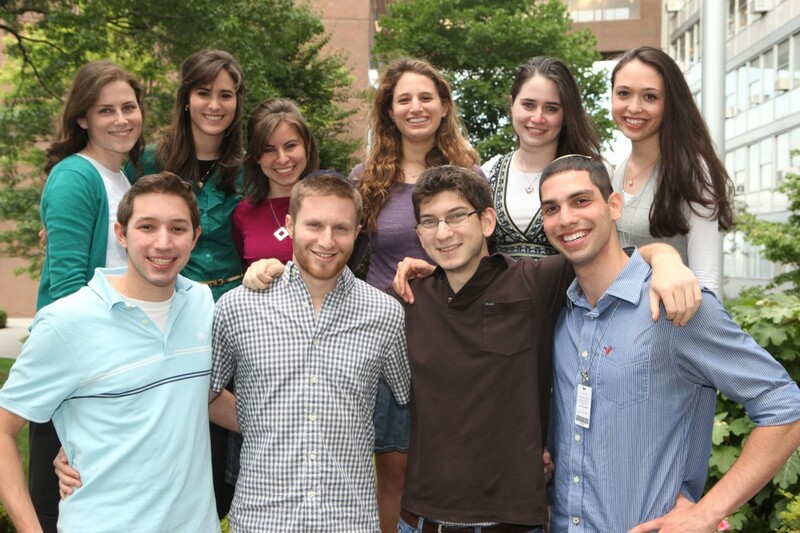 YU Summer Undergraduate Research Program Participants: (Top row) Blinick, Miller, Gutstein, Hasten, Edelman and Wolf. (Bottom row) Barris, Novogrodsky, Kaminetzky and Sanders. Each student is placed in a research laboratory in his or her field of interest and works closely with graduate students and post-doctoral fellows. Group seminars and workshops throughout the summer give participants a broad overview of the many types of research conducted at Einstein and provides them with strategies to become better scientists. In August, the students share their work as part of a poster session. Wolf, who is working the lab of Dr. Alex Cvekl in the department of ophthalmology and visual sciences and genetics, hopes to eventually attend Einstein for medical school. “I’m hoping to gain a more comprehensive and complete understanding of the inner mechanisms of the eye during this program,” she said. The 10 YU students are clustered into two programs. Eight students—David Barris, Mark Kaminetzky, Eitan Novogrodsky and Brian Sanders of Yeshiva College and Rachel Blinick, Batya Edelman, Leah Gutstein and Erica Hasten of Stern College for Women—were awarded scholarships through the Roth Institute Scholars Program, funded by the Ernst and Hedwig Roth Institute of Biomedical Science Education at YU. In addition, Stern students Wolf and Tova Miller were chosen as part of the University Undergraduate Summer Research Scholars Program, which is supported through the Provost’s Office. Each program provides students with a stipend and on-campus housing. Mark Kaminetzky, a Roth Institute Scholar, is majoring in chemistry and hopes to pursue a medical degree. I simply want to say I am very new to blogging and site-building and truly enjoyed you’re web blog. Probably I’m want to bookmark your blog post . You surely come with superb well written articles. Thanks a bunch for revealing your blog site. I just want to tell you that I am just very new to weblog and seriously loved your web site. Very likely I’m going to bookmark your website . You really have impressive article content. Appreciate it for sharing with us your web page. I simply want to say I’m all new to blogging and site-building and absolutely loved your web blog. Almost certainly I’m likely to bookmark your blog post . You really have incredible articles. Appreciate it for sharing with us your blog. I simply want to tell you that I am just beginner to blogs and absolutely liked this web-site. Most likely I’m planning to bookmark your website . You surely have fabulous article content. Thank you for sharing your web page. I just want to say I am just beginner to blogging and definitely loved your website. More than likely I’m want to bookmark your blog . You actually come with terrific articles. Thanks for revealing your web site. I just want to say I’m all new to blogging and site-building and definitely liked your web site. Probably I’m want to bookmark your website . You definitely come with beneficial articles. With thanks for sharing with us your web page. I just want to mention I am beginner to blogs and absolutely liked this blog. More than likely I’m likely to bookmark your blog . You really have great stories. Many thanks for revealing your website page. I just want to say I am just newbie to blogs and actually enjoyed this blog. Very likely I’m planning to bookmark your blog . You surely come with fabulous writings. Regards for sharing with us your website page. I just want to say I am just newbie to blogging and really loved your blog. Most likely I’m likely to bookmark your blog post . You absolutely come with excellent articles. Thanks a lot for sharing with us your website. I just want to mention I’m beginner to blogs and seriously loved you’re blog site. More than likely I’m likely to bookmark your website . You really come with very good articles. Thanks a lot for sharing your website. I just want to mention I am just beginner to blogs and really enjoyed your web-site. Most likely I’m going to bookmark your blog . You absolutely come with exceptional posts. Cheers for sharing with us your website. I just want to tell you that I’m all new to blogging and seriously savored you’re web page. Most likely I’m want to bookmark your blog . You really have amazing stories. Regards for revealing your web page. I simply want to tell you that I’m very new to blogs and really loved your blog site. Most likely I’m planning to bookmark your website . You amazingly have remarkable posts. Thank you for sharing with us your blog.